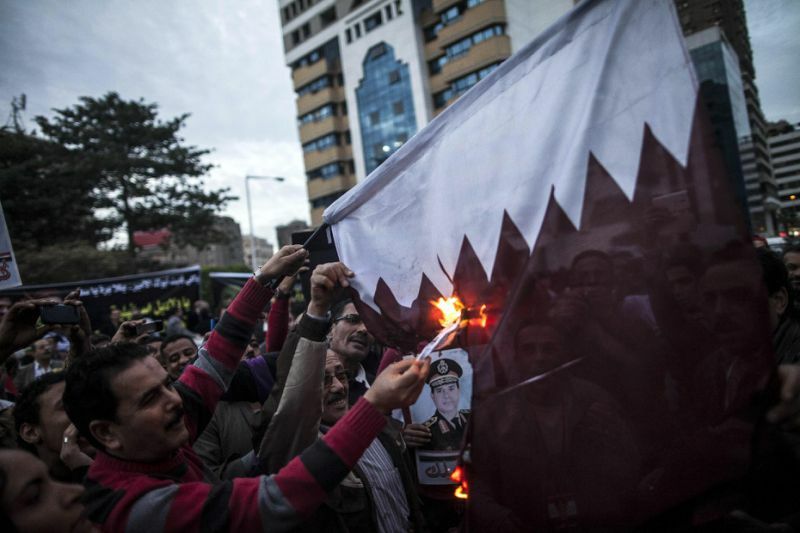 Qatar’s flag is burned by protesters in Cairo in 2015. Saudi Arabia, the United Arab Emirates, Bahrain, Egypt, Yemen, Libya, Mauritania, Mauritius andthe Maldives have cut ties with Qatar over its ‘support of terrorism’. Qatar responded to the accusations as “unjustified”. “The measures are unjustified and are based on claims and allegations that have no basis in fact,” said Qatar’s Foreign Ministry in a statement to Al Jazeera. Egypt’s Foreign Ministry has released a statement, setting a 48-hour deadline for the Qatari ambassador to leave. The Egyptian ambassador to Qatar was given the same period to return to Egypt to implement the decision. There are about 300,000 Egyptian citizens living in Qatar, their fate remains unknown. According to Reuters, the four countries have accused Qatar of destabilizing the region and supporting terrorist organisations such as the Muslim Brotherhood. Egyptian state media reports that the Egyptian government has shut down its airspace and ports for all Qatari modes of transportation. Similarly, Saudi Arabia’s state media reports all Saudi borders, including land, sea, and air, have been shut down to Qatar to protect Saudi Arabia’s national interest. The Saudi-led Arab coalition fighting Houthi rebels in Yemen also expelled Qatar from its alliance for “supporting groups including Al-Qaeda and ISIS and dealing with rebels”. Meanwhile, the UAE has given all Qatari diplomats just 48 hours to leave the country. UAE state media said the Emirati government accused Doha of supporting and funding terrorism and extremism, as well as sectarian violence. Reports from Bahrain cited by Al-Jazeera indicate Qatari diplomats have also been given 48 hours to depart. Saudi Arabia, Bahrain, and the UAE have reportedly given all Qatari nationals just two weeks to return to Qatar. The three countries and Egypt also announced that they have closed their airspace to Qatar Airways. Flights to Qatar have also been suspended. The UAE’s Etihad Airways, Emirates and Flydubai announced that all flights would be suspended from Tuesday morning. Saudi Arabia announced similar suspensions for its airlines. The severing of ties comes amid increasing tensions between Qatar and its Gulf neighbors in recent weeks. Two weeks ago, the three Gulf countries and Egypt blocked Al-Jazeera and other Qatari news outlets after comments were aired on Qatari state television by Qatari Emir Sheikh Tamim bin Hamad al-Thani criticizing Saudi Arabia. In the comments, the Emir denounced condemnations of Iran and said Qatar had a positive relationship with Israel. However, several hours after the comments were aired, Qatar said that the comments were faked and that Qatar’s state newspaper had been the subject of a hack. Despite the denial, Qatari news agencies continued to be banned in Saudi Arabia, UAE, and Bahrain. Egypt has meanwhile long accused Qatar of supporting terrorism, particularly after the ouster of former president Mohammed Morsi in July 2013. Qatar provided refuge for fleeing Muslim Brotherhood members falling the ouster of Morsi and was accused of using Al-Jazeera to undermine Egypt’s national security.